Despite being one of the most prominent buildings on campus, the Carpenter Center is also one of the least well understood. Two weeks ago, I wrote about the need for Harvard to build another Carpenter Center, a building that would get people thinking about architecture—its relevance and its context. Along those lines, I feel that a brief background of the building and self-guided tour of sorts is in order. 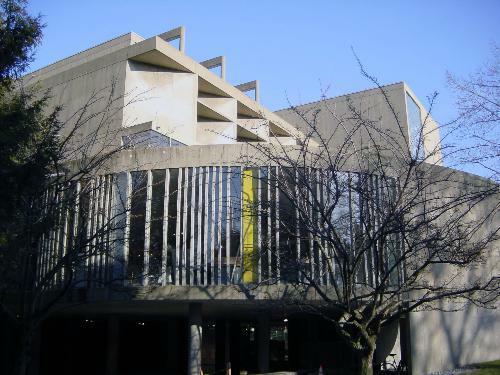 First, the Carpenter Center was designed by the Frenchman Le Corbusier, one of the most famous architects of the 20th century. Completed in 1963, it was his only building in North America and one of the last of his career (too old to travel at age 75, Le Corbusier never got a chance to see the final product). Le Corbusier saw the Carpenter Center as a means of indoctrinating the United States with his version of Modernism. As a result, the Carpenter Center is a compilation of the concrete forms and design principles that Le Corbusier established over the course of his career. From Quincy Street there are two possible approaches to the building: up the ramp or down to the main gallery entrance. The ramp was intended to be the centerpiece of the building, taking people directly to its center. Le Corbusier envisioned the ramp as becoming a major campus pathway, with students constantly flowing between Quincy and Prescott Streets. Unfortunately, Le Corbusier did not understand that few students have any need to travel this route (not to mention that they are lazy and would never walk up an inclined ramp just to walk down the other side). The University has done a commendable job in adding the Sert Café and revitalizing the Sert Gallery, giving people a reason to use the ramp more often. Regardless, the ramp provides an impressive experience; a sequence of spatial events defines what Le Corbusier called the promenade architecturale. Try walking up the ramp on a bright day; the dark underside of the building at the top of the ramp provides a beautiful frame for the sunlit buildings that lay beyond. Walking from the Fogg along Quincy Street, look left at the narrow vertical windows along the curved bay of the second-floor sculpture studio. These windows are called ondulatoires, and have an almost religious feel to them; Le Corbusier used them in a monastery near Lyon, France. Standing at the top of the ramp, look up at the brises soleils, angled baffles intended to obscure direct sun while admitting natural light into the building. Le Corbusier was extremely concerned with the path of the sun and studied its angles at different times of day to great length. As a result, you should revisit the building at different times of day to experience the different types of light that Le Corbusier essentially designed into the building. One marked facet of Le Corbusier’s design is the use of concrete pilotis to elevate the building above the ground. The pilotis allow the landscape to extend beneath the building; they also interact with the landscape directly. When a site plan was being drawn up, Le Corbusier asked that all the tree locations be marked with a high level of precision. In the final design, he aligned some of the pilotis with the existing trees. The best example of this can be found near the entrance to main gallery and film archive. Looking back toward the faculty club, one can see two pilotis in perfect alignment with an eerily column-like tree. The pilotis vary in diameter throughout the building, depending on the load they are forced to carry, and in many places are designed to give the building a feeling of freedom. This is most marked at the rear of the building, where 30-foot columns support the large, curved studio bay. The building at this point looks precarious, and indeed it is. According to William LeMessurier, a famous Cambridge structural engineer, if a large truck were to drive through one of the columns, that portion of the building would likely fall to the ground. The Carpenter Center was not built in its distinct modernist style to simply be different. Instead, Le Corbusier had a philosophical belief that a visual arts building should demonstrate innovation and creativity. A traditional neo-Georgian style visual arts building would almost have been a contradiction. There is a definite relationship between the brick of the surrounding buildings and the concrete and glass of the Carpenter Center. Unlike brick, the light-colored concrete reflects morning sun and captures afternoon shadows, from trees and other elements. The curved surfaces of the concrete compress or elongate these shadows, giving them visual life as the angle of the sun changes. The building can almost be seen as having an inside-out plan, with interpenetrations of exterior and interior through both the design and the use of glass—both clear, as in the numerous large windows, and distorted, as in the glass blocks of the stairwell. At the center of the building is a cubic volume from which the curved studios spaces are hung on a diagonal axis. There is extensive cantilevering and a reliance on reinforced concrete to create large areas of open space. Unlike traditional structures, which rely on load-bearing walls, the Carpenter Center relies on a grid of load-bearing columns. As a result, each of the five levels of the building is designed to be configurable through movable partitions that extend well short of the expansive ceiling. Undoubtedly, many students have walked past the Carpenter Center numerous times without giving it a second’s notice. They are probably unaware that people travel from around the world just to see the building because of its architectural significance and position in Le Corbusier’s oeuvre. Every time I walk past the building, up its ramp, or down into its lower sections, I take a close look at it. Every time I see something new.